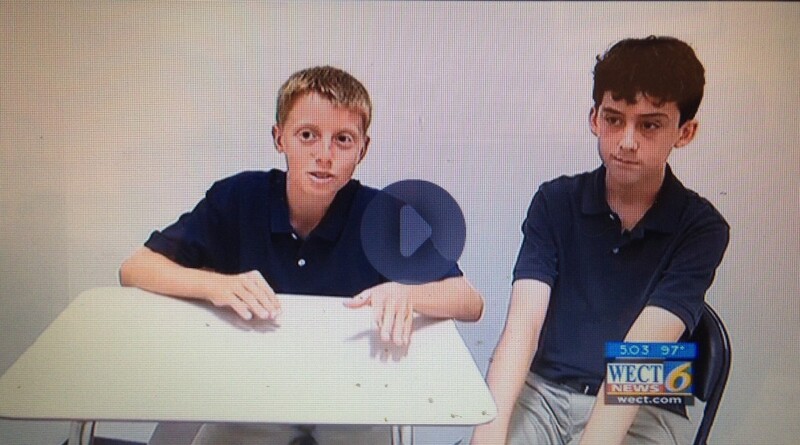 8th Graders Luke Scacheri and Benjamin Eldridge reminisce on Kindergarten, discuss the future. LELAND, NC (WECT) -Many students across the area headed back to school Tuesday morning for the 2015-2016 school year. Parents and students arrived to Charter Day School a little before 7:30 a.m.
About 900 students returned to school. There were a lot of smiles, but some tears too. Sonya Henry’s kindergartner did not want to leave her side. “He was good until it was time for him to get in the car and then he was sad, “Henry explained. And just a few buildings over where the eighth graders are, there’s another kind of sadness. “I’m kind of excited to get it over with but I’m also kind of sad that I’ve been here since Kindergarten and everything, it should be a good year so,” CDS eighth grader Luke Scacheri said. Scacheri said he started his career at Charter Day the same way Ralph did. “I cried every single day of Kindergarten in the morning when I had to leave my mom and go into the class,” Scacheri reminisced. But luckily the tears have faded away and his last first day at Charter Day School is filled with excitement for high school. Classes began for year-round schools, including Codington, Eaton, Lake Forest Academy and Sunset Park. It was the first day of school for students at Columbus Charter as well.